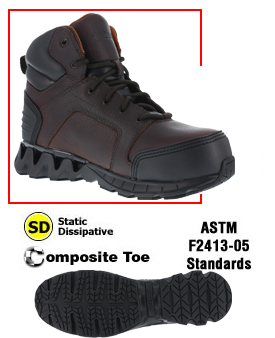 Environments that require conductive foorwear are rugged indeed, so we bring you high-quality Conductive & Static Dissipative Work Boots. Free shipping in the mainland USA! Moisture Wicking Nylon Mesh linings. Dual Density, Direct Attached PU Midsole and Rubber Traction Bottom with ADIPRENE by adidas Shock Absorbing Heel and Rebounding Forepart Pads. 100% Non-Metallic, Extra Wide Toe. Environments that require conductive footwear are rugged indeed. 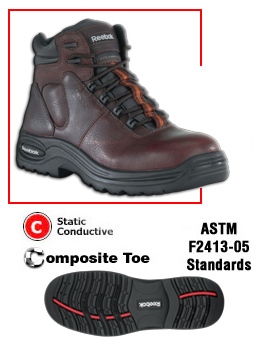 So this boot tests in a resistance range under 10,000 ohms, which meets the ANSI Z41-1999 CD Type 1 standard for conductive shoes and packs the same Converse comfort and performance you've come to expect. 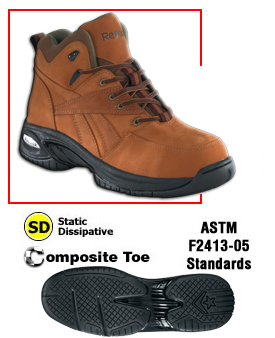 Advantage Composite Toes with ESD built in and keeps working feet protected and padded. Dual density; rubber bottom and EVA midsole. 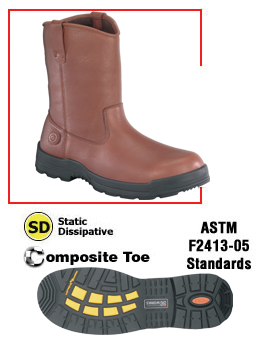 This comfortable, durable composite toe work boot is perfect for the individual who wants everything out of a safety toe.